on October 11, 2017, 10:16 a.m.
Millennials and baby boomers in the UAE and Saudi Arabia feel they are represented better by the media than by advertising in their country of residence according to new YouGov Omnibus research. The online survey comparing the opinions of over 2,000 respondents born between the mid-1940s and mid-1960s (baby boomers) and between the early 1980s and mid-1990s (millennials), asked how well represented they feel by the way they see people look, act and have similar views to them in the media and advertising. When it comes to the media, 60% of millennials say they feel well represented, against 27% who feel that they are either not very well represented or not represented at all. The net score for millennials (those who feel well represented minus those who do not) is 33%; three times higher than that of baby boomers’ (10%). By contrast, under half of baby boomers feel well represented and as many as four in 10 feel poorly represented. 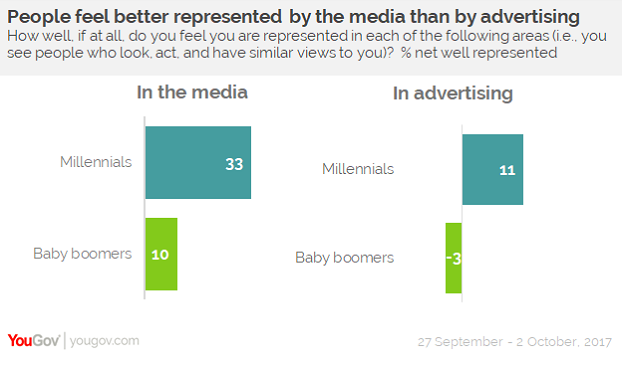 Both groups feel less well represented by advertising than by the media. The net score for millennials is a third lower for advertising than it is for the media. Baby boomers’ score plummets to -3, meaning there are more baby boomers who feel poorly represented in advertising than those who feel well represented. Baby boomers feel the biggest reason for feeling poorly represented is on account of their age (cited by four in 10 respondents), whereas millennials who feel poorly represented say that socioeconomic class is the biggest factor (cited by three in 10). Millennials’ love of the digital world is well-documented, with selfies and social media playing a prominent role in many young people’s lives. Less attention is paid to the time baby boomers spend on social media. The YouGov Omnibus survey also found that as many as seven in ten baby boomers either read or watch content from social media at least once a day; the same proportion as millennials. Despite similar levels of usage, social media appears to shape consumer spending far more for millennials than for baby boomers. While a quarter of millennials make purchases based on things they’ve seen on social media at least once a week just one in ten boomers do. Despite feeling better represented in both the media and in advertising, as many as 3 in 10 millennials feel “left behind” by society, compared to two in 10 baby boomers. However, the two generations are remarkably aligned when asked about their biggest fear/concern. The top three concerns cited by both age groups are their family’s well-being (cited by three in ten in both generations), their health (cited by one in six) and terrorism (cited by one in ten). Though they may share similar fears, the two generations diverge in their career experiences. Baby boomers have had far more mobile careers, with two-thirds having worked outside of their home country. By contrast, just under half of Millennials have. However, as millennials get more experience under their belt this looks set to change. A further third of millennials would like to work abroad in future, whereas just 14% of boomers who have not worked abroad would like to do so in the future. Data was collected online by YouGov Omnibus between 27 September and 2 October 2017 among 2,007 respondents in the UAE and Saudi Arabia. Results are representative of the adult online population in both countries.